I traveled to Oaxaca for many of the same reasons as other people who have visited in recent years, most notably the food: smokey mezcals, rich moles, and hand-made tortillas. It's all even better than you could imagine. 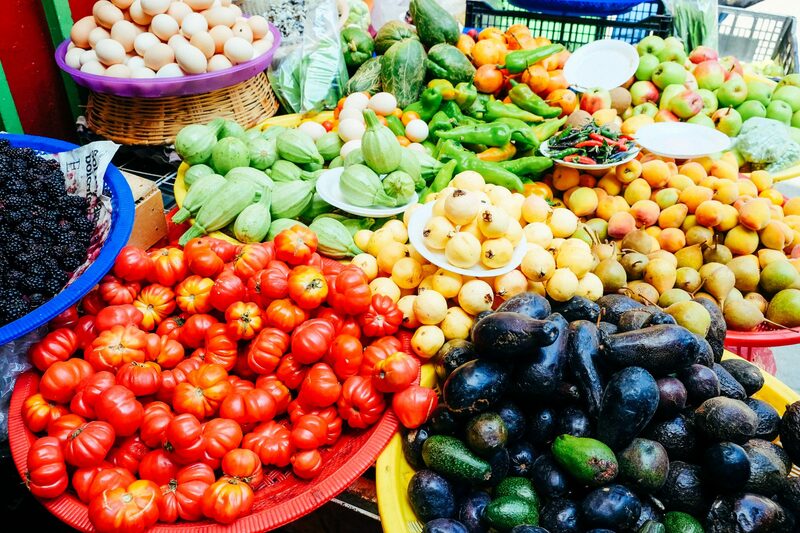 But as I walked the colorful and fragrant streets of the city, I found myself wondering about the families selling fruit on the side of the road, or what the process was like for the women who sold an abundance of fresh herbs at the market, some of which I had never seen before. 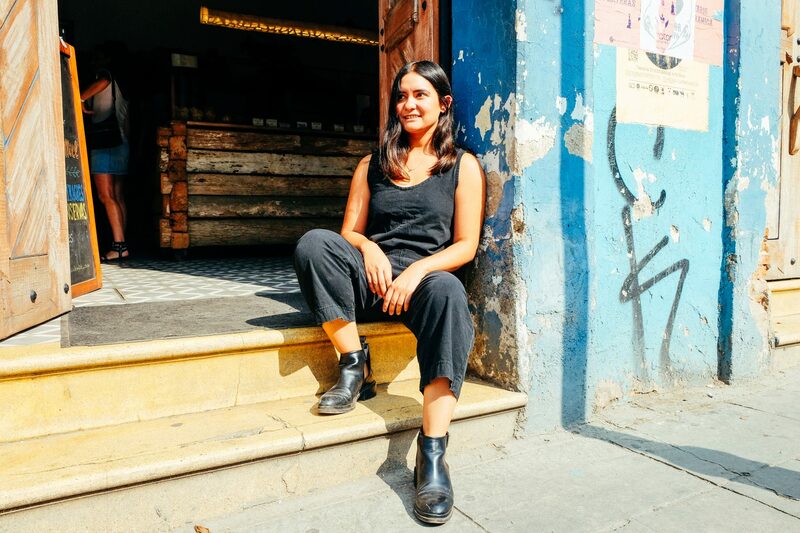 I was fortunate enough to have some of those questions answered by Ana Paulina, a partner at the most talked-about bakery in Oaxaca, Boulenc; and owner of Suculenta, her newest venture that preserves traditionally foraged foods native to Oaxaca and its people. A hardworking, driven, and fiercely smart woman; it was clear to me that in her 4 years of being in Oaxaca, she hasn’t wasted any time. 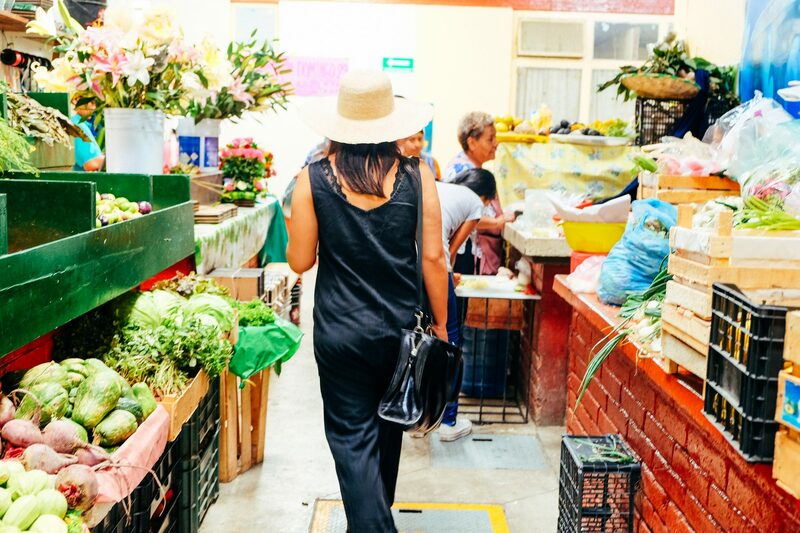 As we walked the aisles together she spoke about what first drew her to this city and why it continues to amaze her, and how she is taking bold leaps to preserve Oaxaca’s diverse food culture and to promote the economic independence of the people who grow it. Was there a person or place that helped to shape your initial experience in Oaxaca? Rodolfo Castellanos changed everything. I first got to know him through his food. Casa Oaxaca changed everything. 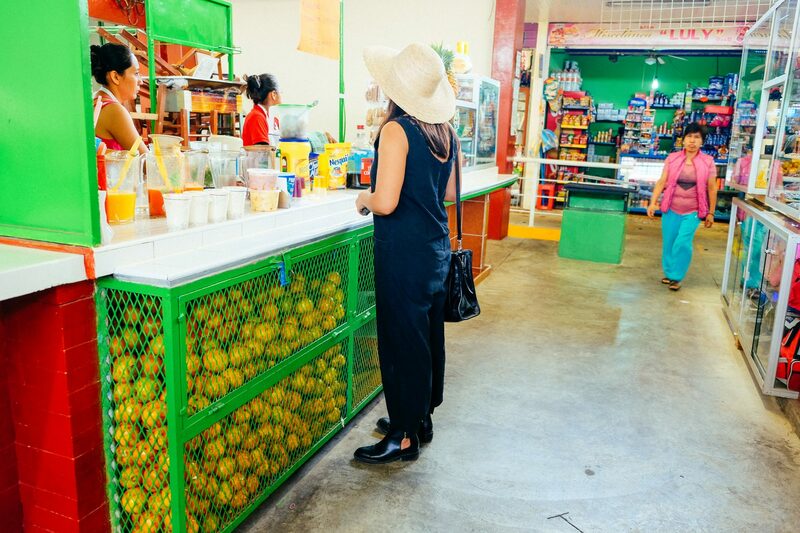 Oaxaca is crazy- every season there’s something new to find: a new root, fruit, or spice. It doesn’t cease to amaze me. I’ve been in Oaxaca for four years, and it’s been that way since I arrived- non-stop. I don’t think I’ll ever finish learning things in Oaxaca. There are so many little towns and each one has something specific- a recipe, a textile, or something else to offer. There are a lot of places I’ll probably never get to go to, but I do get to know the people from those places because farmers bring things to our door. Can you tell me more about the relationships Boulenc and Succulenta have with local producers? Our whole wheat flour is from Nochixtlán, which is a town about an hour and a half from here. Since the bakery opened, we’ve had a direct relationship with the producers. 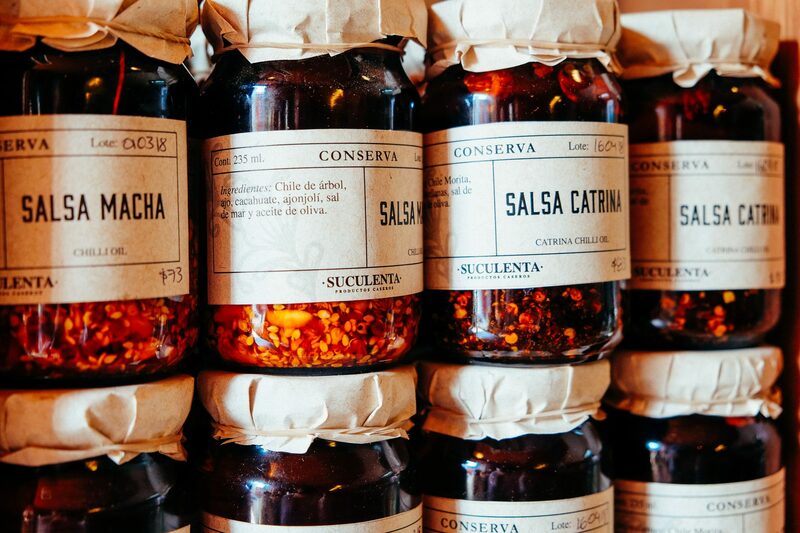 With Suculenta, we focused on preserving certain ingredients. 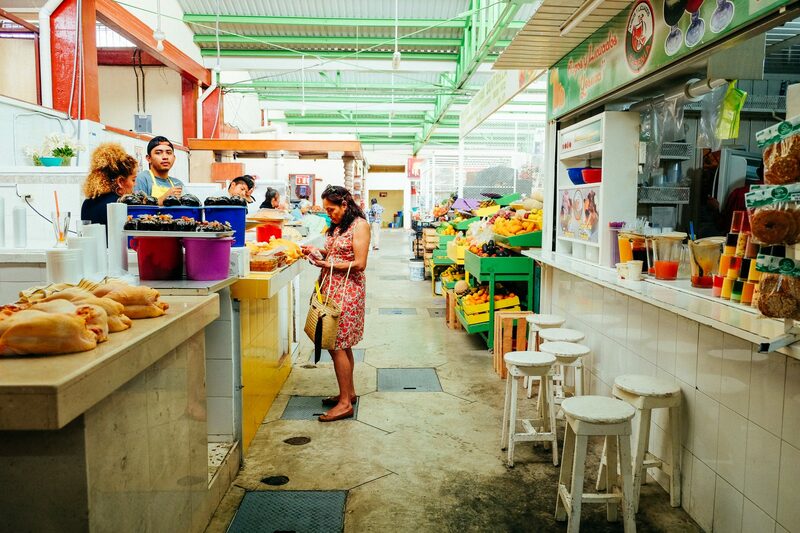 We buy from several local farms and from people coming in from the mountains to the markets. We have a great relationship with a French mycologist working in the Sierra Norte, so we know how to preserve all kinds of mushrooms. He taught some families in La Mixteca how to grow mushrooms, so now we buy from those families, too. We try to buy everything we can from here. Tell me about the work you are doing for Suculenta, and why it is important for the people growing food in Oaxaca. It’s not just a beautiful and delicious product, but a mission-based one as well. Several organizations in Oaxaca are invested in teaching families how to grow food. In some cases, mushrooms. It’s a whole process to teach families a skill, and once they learn it, it requires someone to keep following up with what they’re doing. They’re all able to grow mushrooms, but then the problem is that they don’t have a place to sell what they’ve produced. With mushrooms, in particular, you don’t have a lot of time to sell them before they go bad, so it’s more urgent to find a market. You have to cut them and sell it right then and there. When we started Suculenta, we didn’t have a lot of money, but we wanted to keep supporting the mushrooms that were coming in and we didn’t want the producers to get discouraged. They wake up at 4 a.m., cut the mushrooms, walk 5 kilometers by the highway, wait for a bus, and then arrive in the city only to find out there’s nowhere for them to sell them. It’s a big problem. We knew we were going to be able to buy more of their product in the future, though at first, it was a big investment. We had to start selling extra mushrooms we’d purchased from them to restaurants because I couldn’t preserve everything we were buying. Now we finally can buy and use everything they bring us. We have amazing mushrooms in these preserves. We even make a mushroom pate for our banh mi. If you order a banh mi here, you can buy the mustard, sauerkraut, pickles, pate, and the baguette. You can buy everything single thing that goes into the whole dish. You can do it for yourself at your house or buy it premade as a whole. We aren’t using mustard from Sam’s Club, we’re trying to do everything ourselves. 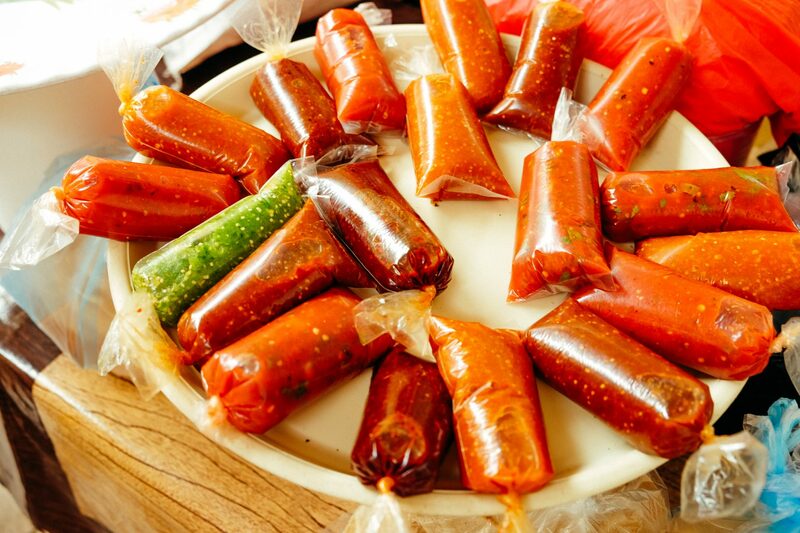 How do you see Boulenc and Suculenta fitting in with the traditional bread and preserve practices in Oaxaca? Mexico is very diverse. We don’t have long winters so we don’t have a season where you can’t get produce because of the weather. Produce grows all year, which is why there isn’t really a preserve culture. The recipes I find for preserves at Suculenta are usually from the US, Russia, or Germany because they’re more used to those techniques. What happens in a lot of Mexico is the devaluation of the products. When you go to the market, you might buy a kilo of tomatoes that are 30 pesos, but the supermarket bought it from the producer at 5 pesos. The supermarket won’t pay more. The producer has to sell their tomatoes really cheap or they throw it away. It happens a lot. There’s a lot of protests when supermarkets devalue products. It is cheaper for the producer to throw it on the streets than sell it. It’s a phenomenon that happens all over Mexico. One other thing is the amount of food in Oaxaca. When it’s mango season there are trees on the street and mangoes rotting on the ground. So I think the way Suculenta fits in Oaxaca is by taking advantage of that. We research and buy several boxes of fruit and make different products out of that single ingredient. When I was in the tomato stage we made ketchup, pizza sauce, cherry tomatoes in olive oil, sundried tomatoes, and tomato jam. The idea is about making different products from the same ingredient. You’re not only stretching the life of the product, but you’re making something that is worth more than 5 pesos. 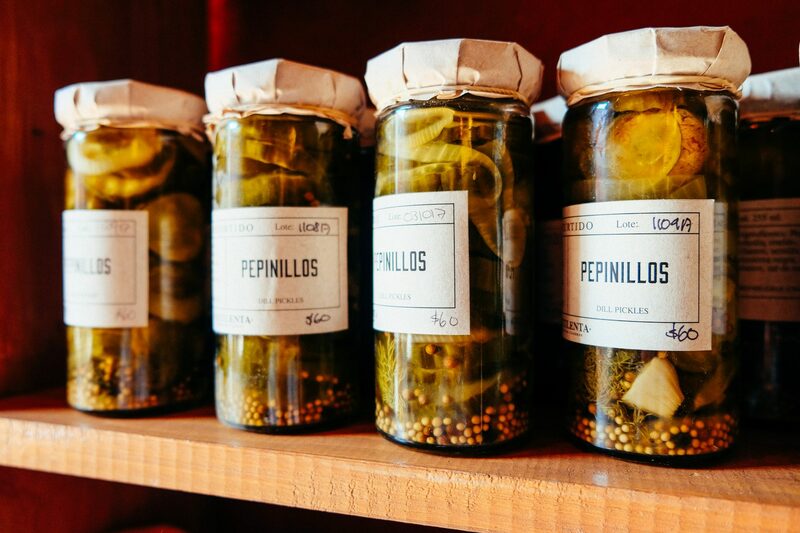 It’s about teaching the producer to preserve so they don’t have to throw away their goods. If they knew how to preserve their product, they wouldn’t have to be in a rush to sell it. You can leave it for a year and it would only taste better. It’s really weird to think that if you’re a tomato producer, you don’t consume your own product as much. 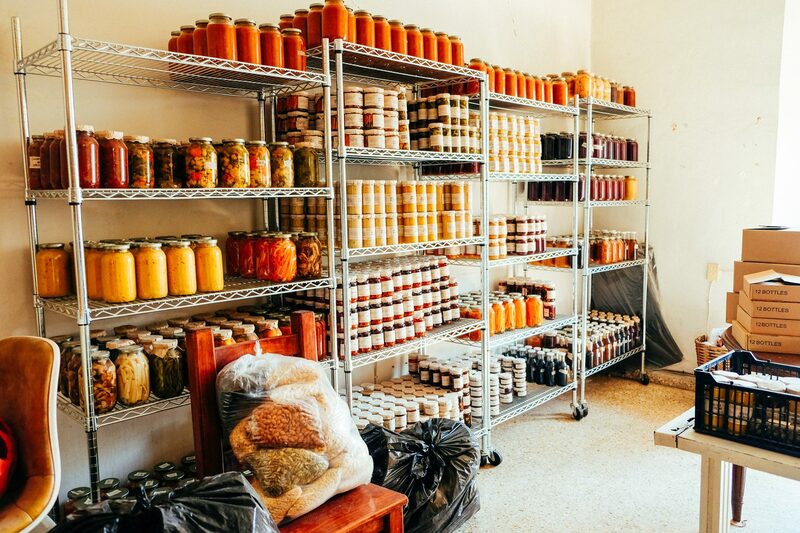 If you make your own ketchup or jam, you have something to trade in your community. I would like to share that knowledge in the future when I have more time, so people don’t throw their product away. It’s such a waste of food and it’s so unnecessary. I know Oaxaca is one of the poorest places in Mexico. How has tourism been affecting the region? There’s a saying in Spanish, “Arma de doble filo”: “It’s a double edged sword.” In a way, it helps because a lot of people in Oaxaca live from tourism. But also it makes other things like rent rise because everything is priced for someone like a New Yorker coming here. And for a New Yorker, rent here would be considered super cheap, but its way out of proportion with what a Mexican earns. It’s actually really hard to find a place to rent. In your opinion, what’s the best way to embrace and support the community in Oaxaca? I think that the best way to support is by supporting local businesses. For example, I always buy things from the ladies that are sitting on the floor at the market. They’re selling products that came straight from the mountains that very morning. It’s different from the other producers who are buying things from a big market. It’s direct. Once you start to distinguish where things come from, I think that’s the best way to help. For example, in the North, if you want to eat organic you can buy it from the organic aisle at HEB supermarket, but’s all imported from the US. If you’re lucky, you can find organic potatoes that were grown locally. It’s much harder there to find organic food. Here in Oaxaca you can buy from those ladies at the market or a farm. It’s really easy to eat organic food here. So how long have you been doing the preserves for? Three years with the store, officially. Can you tell me about your move from northern Mexico to Oaxaca? What are the main differences between traditions and cultures around food that you’ve seen? 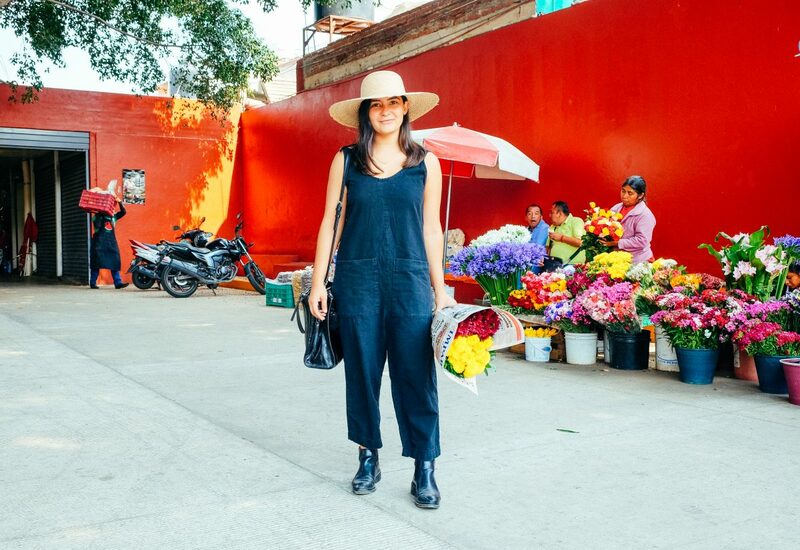 Moving to Oaxaca opened a whole other world. The north is pretty Americanized because it’s close to the Texas border. The pace is really slow in Oaxaca. Businesses don’t open ‘til 9 a.m., even when you need them at 7 a.m. When I was living in Saltillo, I was studying graphic design. Then three years later I’m in the food business. It was really unexpected. I cooked for myself before coming from Oaxaca, but I stepped it up here. 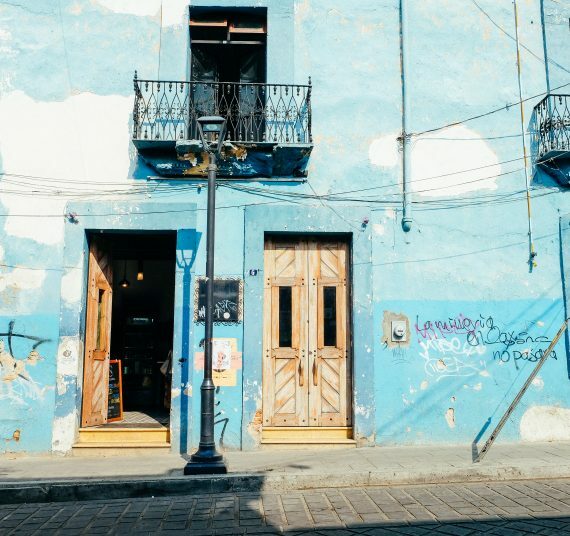 I started getting to know Oaxaca’s cuisine and restaurants during the first few months of being in the city. When I’d go back to the north for vacation and try the good restaurants, there was no comparison to Oaxaca. That’s when I first noticed my standards were way higher than they ever were before. What is grocery shopping like for you? I love cooking. I especially love taking hours to make a meal. If I am making a sauce, I like to do it from scratch and take two hours, but I don’t get to do that very often. So definitely my grocery shopping comes from the local markets in Oaxaca. Usually once a day. I wish I had more time to cook for myself. If I have Sunday off, I usually cook. A lot of seafood. My dad is from Mazatlán, which is on the coast. My mom and I are from Sabinas (North of Mexico), but I grew up in Saltillo. My grandfather was a fisherman, and I had been fishing with him since I was 4. So you grew up eating a lot of seafood. Was there anything you remember about cooking at home? I ate pretty basic Mexican home-cooked meals. Tacos de picadillo, a lot of rice, a lot of beans. My mother cooked almost every single day. Definitely corn,tortilla de maiz. It’s way different here because they use the actual corn in Oaxaca. Over in the north they use processed tortillas. Hoja Santa is another favorite. It’s like a really big leaf, which is often used with beans inside a quesadilla. You buy it fresh, but also sometimes I dry and grind it and put it on everything from rice to soups. You get a lot of fresh flowers here, too. These smell like fruit loops! Here, try this. (Handing me a juice) This is a green juice with noni. It’s considered to be a powerful fruit- it has a lot of fiber. It’s thought to be good for your health, but it’s really hard to eat. I always drink orange juice with beet kvass at Boulenc, and I get the green juice when I’m at the market. I haven’t taken a proper vacation in two years. But honestly, I don’t feel the need, I’m having so much fun here and there’s so much to do.